2. Saute the green chillies, carrot, capsicums, onions and tomatoes for 2 to 3 minutes. 3. Add the cooked noodles and mix well. 4. Add salt and coriander leaves. 5. Stir once or twice until well mixed. Tip: If desired, you can also add boiled potatoes and spring onions. 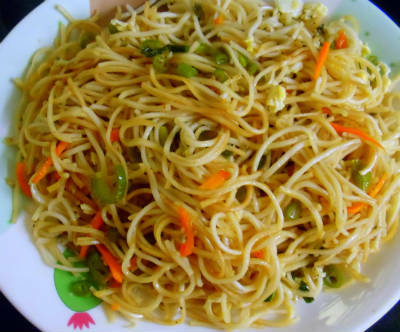 Feel free to comment or share your thoughts on this Capsicum Noodles Recipe from Awesome Cuisine.